Activated abilities of creatures can't be played. Good evening, Ragnar0k. Always glad to have good conversations with magic players. 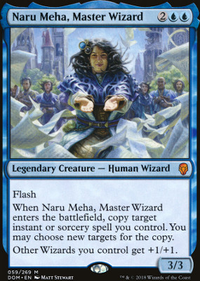 So I'd like to first hear you continue your thoughts about the cEDH and its mana curve. I just looked at the top 5 cEDH decks here on Tappedout. Respectively, their mana curves are: 2.48, 3.03, 3.84, 2.18, and 2.51. Continually down the list, there are about 1 in 5 that do come below 2.3, but they most come closer to 3.0. 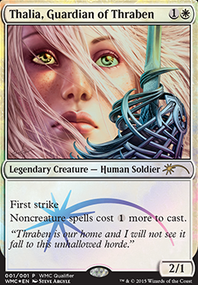 I would like to see a cEDH deck that has a 1.7 mana curve, cause that would be hella fun to look at. Infinite mana is cool, but it's not fun if you don't have a lot of cards to play, which as you've mentioned, is a weakness in . I think this deck excels in fast mana, rather than infinite mana. You have to hit quick and hard here. I don't personally believe that this deck needs to run infinite mana, just for a card or two, because frankly, Purphoros, God of the Forge + Panharmonicon + and ETB card like Siege-Gang Commander = 32 damage per each opponent. 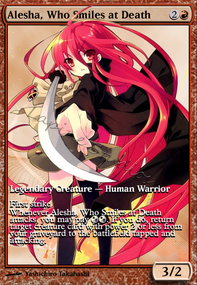 I do agree that I need more stax pieces, as I've tried Cursed Totem in my Azusa deck. I think more stax would be fun. Also, are there any red tutors that I've missed out? I've seen artifact tutors, but they are expensive (looking at Planar Portal ). I'd rather draw into them with Wheel of Fortune . What do you think needs to be pulled out the deck for possible changes? Hey, I like the idea of this list; but have a lot of problems with how it runs and it being considered cEDH., and the primer as a whole. First of all, your opening spoiler is inaccurate. The average cEDH mana curve does not sit at 2.8-3.5. That is completely ridiculous. On average, a cEDH deck sits around 1.7-2.3, and 2.3 is even a bit high. Second of all, you don't run infinite mana combos, which make your X spells like Firecat Blitz shine. Third, your board interaction and stax pieces are too few and far between. 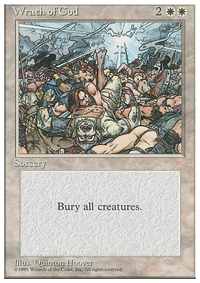 Stranglehold and your land destruction/hate pieces are nice, but Cursed Totem , Grafdigger's Cage , Chalice of the Void , Ricochet Trap , Shattering Spree , Thunderclap , and Mogg Salvage would further improve the stax and interaction of the deck greatly. The three large downsides of mono-red are lack of access to tutors, interaction, and sufficient ramp. That's why you should look to amp both of those up as much as possible, and once you've reached the proverbial ceiling, acknowledge red can only do much on its own, and hunker down into stax. You most likely won't end up being the fastest deck at the table with these changes, but you will be able to slow down others' decks with T1, 2, and 3 stax pieces to the point where you're a contender. The Koziest of tutor targets. 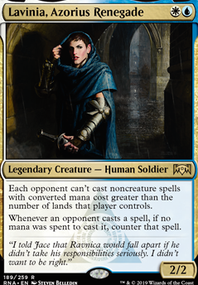 Ok; so he can tutor for kozilek; but the engineered explosives on 1 is pre' bad for this deck anyway - most of your problem permanents are 2 mana ( Cursed Totem , Defense Grid , Sphere of Resistance , Null Rod / Stony Silence , tibalt). There are so very few options who get nutted by blast zone (I think you have six 2-drops) that it seems fairly worthwhile. Yes, I know that all of your removal hits all of those problem-cards already as you're in green, but this is a land that hits multiple at once, as opposed to being 1-for-1, this card is (genuinely) card parity in a 4-player game (since every card has to be 3-for-1 or it's card disparity). n0bunga - Cursed Totem does stop Oblivion Crown lines since Crown give the creature the ability. Is there a reason Caustic Caterpillar is used over Krosan Grip ? Seems like Cursed Totem is more likely to hose us with the former and the latter is basically impossible to interact with. Patryn: Basically? 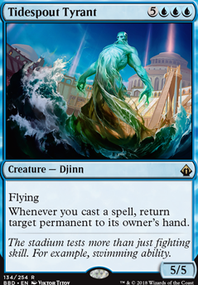 It also lets me viably filter my hand with mana leftover for counterspells I didn't end up needing, lets me smooth the inevitable "I drew only trash" hands off of Wheel of Fortune , and can act as a backup for my commander if something like Cursed Totem is out. Plus it cantrips itself when I have lots of mana but few cards. Cursed Totem : shuts down a ton of decks. As Foretold : Allows you to cast multiple cards every turn if you play it right. Can have a potential free counterspell every turn if you have 2 or 3 counters. Pongify : Redundancy since you have Rapid Hybridization . Reality Shift : Same as Pongify and Rapid Hybridization . Aura of Silence : Meta inclusion for artifact or enchantment heavy decks. Very good in two headed. Delay : Effectively counters a spell with Lavinia out. Talisman of Progress : Decent mana rock. Azorius Signet : Another decent mana rock. 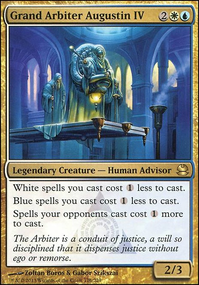 Leonin Arbiter : Cat Jesus shuts down Fetches, Tutors, etc. Smothering Tithe : Goes without saying. Land Tax : Another obvious recommendation. Kataki, War's Wage : Since you're light on artifacts it might be a good addition. Swan Song : Efficient counterspell. Mystic Remora : Might not be good in our meta but is a very strong card. Rhystic Study : Another obvious recommendation. Crucible of Worlds : Recover from MLD. Hey, looks good, but consider adding more hate? Aven Mindcensor : flash, makes your opponent's tutors less effective, even Fetch lands. Containment Priest : flash, low mana cost reanimation is one way to get around the hate, this stops it. Fatespinner : making your opponents choose which step they want to play for the turn is pretty good for you. Luminarch Ascension : excellent win condition when your opponents are locked down and in multiplayer Commander it gets four counters fast. Two mana to cast and to repeatedly make 4/4 Angels is great when lands are being disrupted. Works well with Mana Breach because you aren't casting a card to make an Angel. 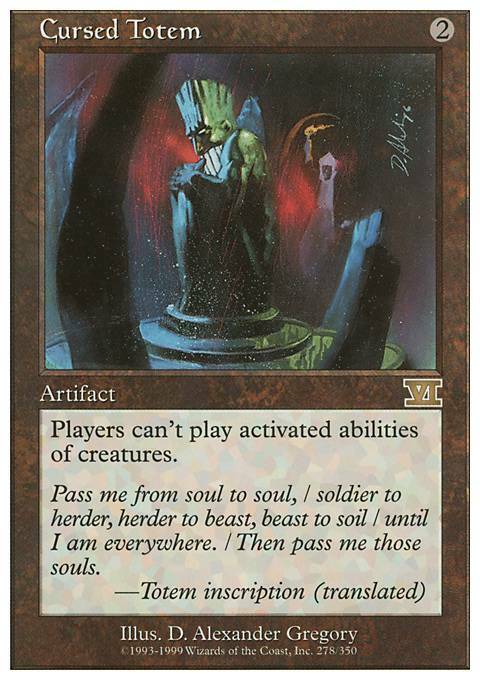 Cursed Totem because Ascension is not a creature and Fatespinner because if your opponents are having to choose which step they get to use then combat is most likely the step they will choose to skip. Dramatic Reversal : combos with Isochron Scepter and mana rocks for infinite mana. Use the combo with Sphinx's Revelation.